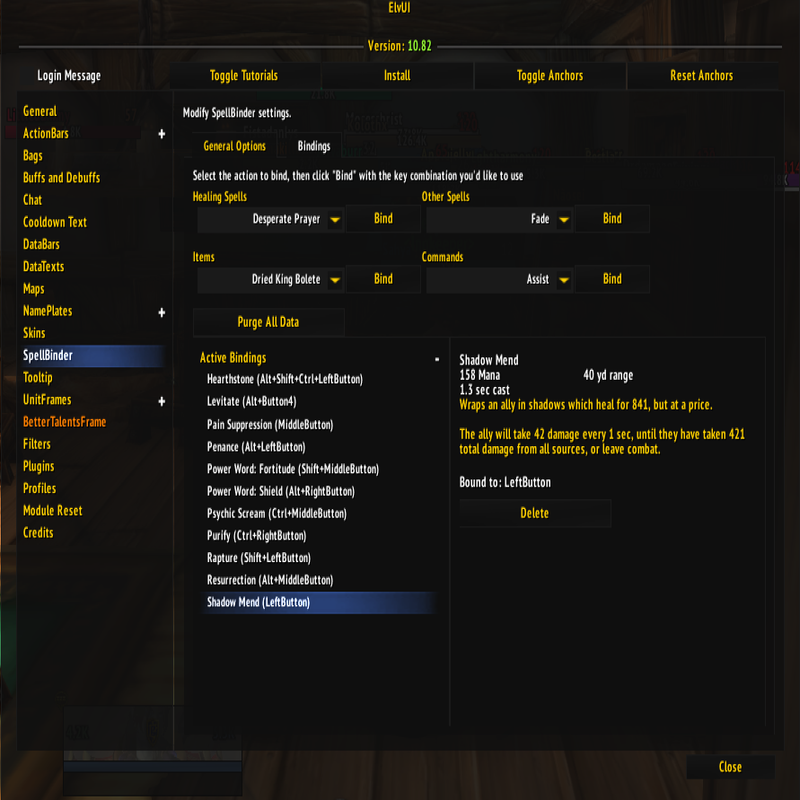 SpellBinder is an easy to use click binding interface customized for ElvUI. You can bind any combination of modifier keys and mouse button to virtually any ability that is capable of being used on a friendly target. It also supports usable items, both in your bags and equipped. Because some people like to bind targetting, focusing, assisting, and the context menu to alternate keys, it will also allow you to do that. It does not yet support hover casting, but I plan to add that feature next. Optionally, your bound spells will appear in your tooltip when hovering over a unit frame. They will update dynamically when modifier keys are pressed, and also display the cool down and cost of your abilities. 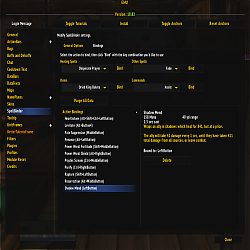 To bind an ability, just open your ElvUI settings, find the ability in the appropriate drop down menu, and then click the associated "Bind" button while holding any desired modifier keys. E.g. If you wanted to bind "Flash Heal" to "Shift+Alt+RightButton", you would select "Flash Heal" from the drop down menu, then right click the bind button while holding shift and alt. If you rebind left button or right button you will lose your ability to target a unit or bring up the context menu! I cannot stress this enough. Unless you don't care about these functions, it's a good idea to use the "Commands" drop down menu to bind them to alternate buttons. That being said, if you do accidentally bind left button or right button, SpellBinder is smart enough to default them back to target and menu respectively if your binding is removed. Binding items works exactly the same way as binding abilities. SpellBinder will allow you to control the colors of the additions that it makes to the tool tip, or disable those additions entirely. If you accidentally wreck your colors, and can't get them back exactly the way you want them, there is a "Reset Colors" button to set them back to default. You can create one binding set for all your specializations, or different binding sets for each. To turn on specialization based bindings, use the "Spec Based Bindings" toggle in the "General" options. SpellBinder does not play nicely with Clique. If you have Clique installed, you must either uninstall it, or disable it, or SpellBinder will not work. offending line, which causes SpellBinder to produce a lua error. Thanks dude! Good suggestion too. I'll do that. Though, it is on Twitch and Curse Forge as well, just FYI. I'm glad to hear you're enjoying it! That's what makes all the work worthwhile. Can you pls also upload this add on to tukui/elvui website? So we tukui client users also can get updates for it cause some of us dont use minion :/. Last edited by Jakke : 10-12-18 at 12:01 PM.